As I write these words it's -21 C and the wind is howling. There is no antenna work getting done. I am well behind schedule with my winter projects due to the severity of the weather. In time it will moderate and work can resume. Until then I am limited to what I can do indoors. One of those is sitting at the computer and modelling antennas. Since I was planning to begin construction of the 80 meter vertical array in the winter I have revisited my original design. Changes have been made. Please refer to that article for design and construction details not included here, and for additional background. I won't unnecessarily repeat myself. For the first change the tower (driven element) will be a little shorter. This means that the "stinger" at the top will need to be ~6 meters tall rather than just 1 meter to be λ/4 on 80 meters. Adding a switchable section on top to have a 160 meter vertical is physically unreasonable with the now much longer stinger. I had hoped to use the extensive radial field on 160 meters, keeping land use and cost to a minimum. This plan has also changed. For contests I do not want to be in a position where I cannot be on 80 or 160 meters at the same time, whether for SO2R or multi-op. For the next few years over the duration of the solar minimum these may be the only two productive bands for several hours at night. The other reason is that I have been unable to come up with a design to switch between 80 and 160 meters that does not compromise performance on 80 or 160 meters or both. Whether it be a trap or mutual impedance with an isolated pole and top hat for 160 meters there are negative impacts on the 80 meter array's pattern and bandwidth. To be clear, it can be made to work, just not to my satisfaction. With this exclusion I am free to focus on 80 meter performance. Despite this the physical design still constrains the electrical options. When I first developed the model I did not own this property and could not predict the specific layout of the property and my site plan for towers and antennas. I am in a better position to do so now. A casual search for additional sections for my small tower -- as the main support and driven element -- didn't turn up anything suitable or economical. Since the tower is currently 14 meters tall (6 x 8' sections, with splice overlap) and a λ/4 on 80 meters is ~20 meters a "stinger" of ~6 meters length is required. This is straight-forward. However the original plan for a 20 meter tall tower allowed for an isolated stringer for a 160 meter vertical with a capacity top hat. The wire parasitic elements will continue to be supported from the top of the stinger. Due to its lower height (14 meters vs. ~25 meters) the wires cannot simply be wires hanging from support catenaries. I am therefore using angular T-top verticals. The array will closely resemble the original design by K3LR, details of which can be found in ON4UN's Low-band DXing book. This adds some uncertainty to the NEC2 model due to the odd shape of the parasitic elements. This must be compensated for during construction and testing with an antenna analyzer. I found this with the similarly shaped 160 meter antenna I recently built, which resonated ~80 kHz lower than the model. Interestingly there is a chart in ON4UN's book that recommends dimensions that appear to be more accurate than what I can model with NEC2 (EZNEC). I expect the same for this antenna. There are two additional changes I'm making. The first is to exclude SSB. This simplifies the design and construction without giving up too much with regard to my operating interests. I can always add it later. The array will be an omni-directional single element vertical between 3.65 and 3.8 MHz. When receive directivity is needed it can come from the Beverages (still to be built). A further change is to radial system. Rather than busses at intersections of radials between the 5 elements I will put down 5 independent and overlapping radial systems. This is difficult to model so I can only rely on reports that performance is not compromised. My reason is solely to simplify construction since creating the bare copper busses and the multitude of soldered connections, and not with lead-tin solder, is a lot of work. The price is the amount of radial wire required. I can change to a bus system later if I wish or if necessary to optimize performance. The array is designed to act as both a 3-element vertical yagi and as an omni-directional λ/4 vertical. Since the yagi performance is narrow band it is designed for CW only. However as a simple vertical it can be more broadband than that, and indeed can be made to work well from 3.5 to 3.8 MHz. Therefore the first objective is to resonate the driven element more centrally in the band; the L-network -- switched in for yagi operation -- is easily adjusted to accommodate the higher resonance of the driven element. After some modelling work I settled on 3.6 MHz as the resonant frequency for the driven element. The match is very good, deliberately favouring CW and the DX & contest segment of 80 meters which is what matters to me. You can choose another frequency without affecting yagi performance since a matching network is required regardless. Keep in mind that a matching network may be required as the radial system is improved beyond that in this model since the feed point resistance will drop. The impedance is dependent on the ground system since the ground loss is in series with the radiation resistance. For this model I used MININEC ground in EZNEC and inserted a 5 Ω load at the base of all 5 elements to emulate a very good radial system. This is far easier than creating a radial field for all 5 elements in the model yet gives results that are close to reality. The load resistance can be adjusted to test the antenna's predicted performance with other radial systems. There are tables of approximate equivalent resistances of radial systems (length and number) to be found in several places, including in ON4UN's book. I'll have more to say later about the radial system and its effect on the antenna. The next step was to design the wire parasitic elements, including their vertical and T-top lengths. Spacing to the driven element in all cases is 10.5 meters, or λ/8 in the CW segment of 80 meters. Since the array is reversible different director and reflector spacing is not possible. Consequently there is some loss of performance (gain and F/B) relative to an optimized (unidirectional) yagi, though not enough to be of practical concern. As I saw with my 160 meter antenna the model for an element of this style is not accurately modelled using NEC2. Two reasons of which I'm aware are the acute interior angle of ~45° on the low side of the T and the effect of ground. The error can be corrected during construction by floating all the other elements including the driven element (disconnected from ground) and adjusting the wire element to self-resonance at 3.68 MHz, as a director. Symmetrical trimming of the two halves of the T is recommended. With the 2.1 μH reflector coil in line at the element base the self-resonance is 3.45 MHz. First tune the wire element as a direction and then with the coil in line adjust the coil, not the element, to tune its self resonance as a reflector. Since the radiation resistance of a yagi is lower than a simple vertical a matching network is required. 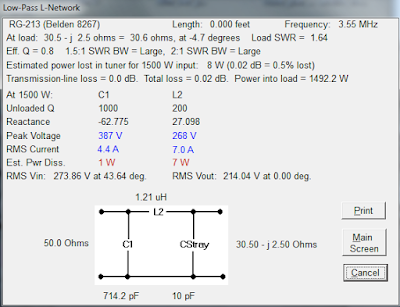 I used TLW (comes with the ARRL antenna book) to design the network based on the EZNEC reported impedance. 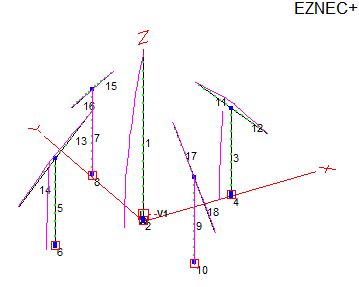 The designed network is inserted into the EZNEC model to confirm that the antenna is now matched. In practice you'll want to measure the array's impedance once it's built and then design the L-network to transform that impedance to 50 Ω. As you can see coil Q is not critical as there are no large losses in the small transformation ratio required. I used a "low pass" L-network to help attenuate harmonics for SO2R and multi-op contest operation. Within reason the director and reflector self resonant frequencies can be adjusted to centre the array on another band segment without going to the trouble of a complete re-modelling. The reflector coil value stays the same. A small improvement in gain and F/B can be achieved by tightening the tuning of the parasitic elements. For example, lowering the reflector coil to 1.8 μH gives several more db of F/B and ~0.2 db of gain. In this case the director self resonance should be lowered ~30 kHz. The SWR bandwidth will be narrower. That may be a fair trade-off since the SWR bandwidth of this antenna is superior to the original. For this specific case the designed L-network still works well. I modelled the elements with insulated AWG 14. The vertical length of the wire elements is 10.2 meters and each half of the T is 6.3 meters. 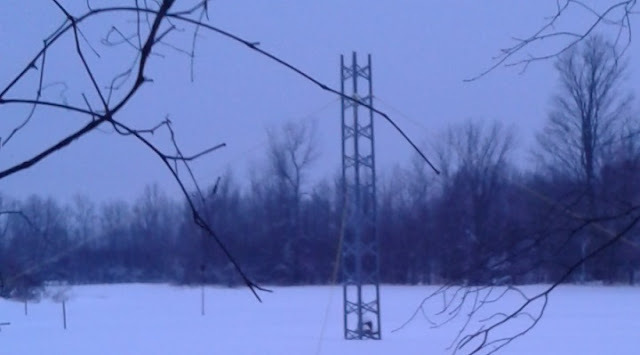 The vertical length is a compromise between minimizing the length of the T (capacity hat) and minimizing the distance from the tower than the element must be anchored. I want to keep the anchors within the radial field to reduce the amount of land dedicated to the antenna which would otherwise have to be taken from the haying. If one is careful the tuning is only required on one parasitic element. The others can then be cut to match it. Even so it is probably wise to measure and trim them all to resonance to avoid surprises. Either way it is done the reflector coils ought to be adjusted to accurately resonate the elements as reflectors. Let's look more closely at the numbers, in particular in comparison to the original design. I kept the 5 Ω equivalent series resistance of the ground loss to ensure the comparison is valid. While not charted the SWR bandwidth is superior to the original design. The T-top elements at least achieve that much. Although the loss of F/B is disappointing the overall performance change is neutral in my opinion. You may feel differently. While the wider bandwidth is not consequential to a pure CW operator it does matter if your interests include digital modes and SSB. With coil switching to support the SSB segment (as in the original design, and which can be added to this one) it can be a good performer from 3.65 to 3.8 MHz. Perhaps one day, but not initially in my case. F/B performance is less of a concern where this array is primarily devoted to transmit and a separate, multi-direction receive antenna system is available. Those using a 4-square antenna on 80 meters often reporte they only occasionally use their receive antennas since the 4-square's F/B is quite good. That is one comparative disadvantage of the yagi array. Before constructing the model I speculated that the F/B would improve. The reason is that the top of the T of all the wire elements lean towards the driven element, thus increasing capacitive coupling with the driven element. This is how the Moxon works where critical coupling serves to equalize current, a necessary condition for a high F/B (field cancellation). Of course there are 3 elements, not 2, so perhaps the better comparison is a Spiderbeam style of yagi. Obviously this didn't happen. Looking at the element currents it is clear that the elements are nowhere close to critical coupling as the tips come no closer together than 6 meters (~0.07λ). Another hope dashed on the shores of reality. I notice that the March QST has an article on a 3-element vertical Moxon yagi. Unfortunately I don't have it yet since it would be interesting to compare. If it looks promising I may model it and compare to what I this yagi design. Should that happen I'll write a follow up article. It is no surprise that the quality of the radial system and the conductivity of the ground below have a strong influence on the efficiency of vertical antennas, especially ground mounted verticals. For every antenna we have to find an acceptable trade off between cost & convenience versus performance. Directive arrays such as the vertical yagi and the 4-square are more affected since their lower radiation resistance results in greater ground loss versus a simple vertical for any given radial system. Compared to perfect ground this vertical yagi and the 4-square have approximately the same peak gain ~6.5 dbi. The 4-square has better F/B and both F/B and have a much wider bandwidth. On the other hand the vertical yagi is simpler, cheaper, more amenable to experimentation, direction choices and the addition of more directors. For me these make the choice easy. The majority of contesters I know choose the 4-square since their primary motivation is competitiveness without undue time spent on experimentation and home brewing the control system. When ground is imperfect, as it always is, the 4-square has greater efficiency than the vertical yagi for any given radial system. 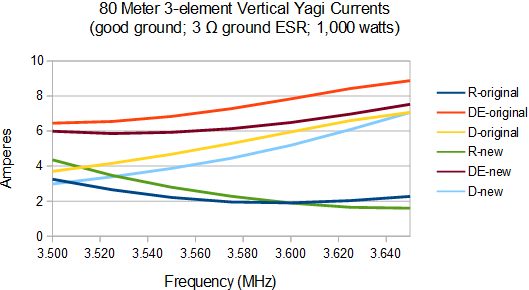 The vertical yagi's radiation resistance is lower due to the closer element spacing -- λ/8 vs. λ/4 -- and the consequent higher element currents lead to higher I²R ground loss. The better the radial system the less the difference. Providing you are committed to an extensive radial system there will be little efficiency difference between the two antennas, even accounting for the dump load (up to -0.5 db loss) in the 4-square. As ground quality improves the vertical yagi's peak performance moves lower in frequency. As with any yagi the frequency of maximum gain is correlated with minimum radiation resistance. For this antenna that occurs below 3.5 MHz. Over a perfect ground this vertical yagi's gain peaks ~3.47 MHz and the peak F/B rises well above 20 db at 3.525 MHz. If the antenna is built with a superior radial system, one with an equivalent series resistance of 3 Ω or less it can be worthwhile to shift its tuning upward by 30 or 40 kHz to exploit that change. With the very good but not great radial system in my model -- 5 Ω -- the modelled ground loss is -2.4 dbi, although it varies with frequency, increasing towards the bottom and top of the operating bandwidth. EZNEC reports quite high loss as the frequency increases, exceeding 300 watts at 3.65 MHz. This isn't bad. You can always add more radials over time if desired. The above chart compares base element currents for the original and new versions of the array, both with 3 Ω equivalent series resistance for ground and 1,000 watts, to match the values I chose in the original article. It is possible to greatly reduce ground loss by improving the radial system for the driven element. In fact the loss becomes quite low when the driven element ground resistance is lowered to 2 Ω and the parasitic elements to 5 Ω. Review the original article and note that it is more important to lower the ground loss in the driven element since its current is always higher than in the parasitic elements, which is unlike the 4-square whose elements have no unique identity. In its omni-directional configuration the ground loss is lower. For a fixed amount of wire the performance can be optimized by putting more of that wire into the driven element radial system than the 4 parasitic elements. This is not a 4-square where the elements should be treated equally! You'll even gain some performance benefit by use of wire thicker than 14 AWG in the parasitic elements; I'll be using 14 AWG wire since that's what I have on hand. By using MININEC ground the details of the radial system can be glossed over by substituting fixed load resistances between each element and the perfect ground. That detail cannot be avoided when designing the actual radial system. Aside from the size of the radial system to achieve the target ground loss the topology is important since the radials are longer than the distance between elements. That is, they must either overlap or be connected. I modelled connected and overlapping radials quite some time ago in an attempt to determine whether one is better than the other in phased and parasitic vertical arrays. Although there are measurable and significant differences in the radial current amplitudes and distribution in the end it seemed to be one of small differences rather than one topology being obviously superior. In both cases the currents on radials between active elements can become quite complex, and perhaps not intuitive, due to the superposition of fields of the mutually coupled elements in the return paths through the radials and ground beneath. Overlapping radials are easier to construct but more expensive. The capacitive coupling between crossing radials is only significant off to the side where currents are lower and voltages higher at the crossing points. Radial interconnection, via busses or directly, is difficult in practice and forces return current to zigzag at the interconnection points. This is difficult to model and compare. My present inclination is to go with overlapped radial fields for each element, based partly on my (inconclusive) models and not well quantified data (to my knowledge) from experimenters. I intend to keep it simple and create a thick radial field for the driven element where the potential loss is greatest and sparser and shorter radials for the parasitic elements. I want them shorter so that the land impact is minimized. Long radials are not a problem for the driven element since it's at the array's centre. Should I be unhappy with the results I can revisit the decision and redo the radial field. What is the reality of performance? Modelling is not the final word on an antenna of this type. Ground influences, radial topology and the environment have significant impacts that are very difficult to model. NEC4 can do better than NEC2 though even that has limits. Relying solely on models to characterize performance and comparison to the 4-square (this array's nearest competitor) may be unwise. How will they perform in practice? Perhaps the greatest problems with comparisons are propagation variability and instrumentation for measuring differences. Direct A/B comparisons are typically impossible since no one I know has both a 4-square and a 3-element vertical yagi for the same band. F/B on both antennas is sensitive to tuning. I wonder how many 4-squares are tuned so well that F/B measures at or near what is theoretically possible. Maximizing F/B is difficult in any antenna since balancing phase and amplitude so that near perfect cancellation of fields in the reverse direction occurs. Consider than 30 db of F/B requires 99.8% field cancellation! That is a challenge even with commercial phasing and switching systems. Claims of 25 to 30 db or more of F/B should be looked at critically. How was it measured? With an S-meter? That is a sure path to overstatement. S-meters are not linear and follow no standard. There are a few recent model SDR receivers that do better by digitally compensating for the analogue data coming from the receiver. Unless you have and can confirm calibration no S-meter should be relied upon for a dependable measurement. We have also seen that the vertical yagi F/B is sensitive to ground loss, and therefore the quality of the radial system. More and longer radials improve gain and F/B. Even so it can never reach the performance of a well-tuned 4-square. Even then the performance bandwidth is narrow. Many owners of 4-squares find that no separate receive antenna is necessary other than in exceptional cases since the directivity is quite good. That's persuasive. A vertical yagi will require resorting to a separate highly directive receive antenna more often than with a 4-square. I believe I can live with that. I may change my mind after building and living with this antenna for a while. Unlike in an earlier article that derided the importance of F/B the viewpoint I espoused is less supportable on the low bands where good directivity is needed to copy under the prevailing low SNR conditions. The construction and testing sequence is laid out above in the modelling section: tune the driven element after construction it and its radial system and then move on to the wire elements, tuning each of those with all other elements floating. Only then should the system be driven as a parasitic array and the L-network designed and built. I will initially use 20 meter long radials for the driven element and 15 or 16 meter radials for the parasitic elements, as reasoned above. My aim is 32 radials for the driven element and 16 for the parasitic elements. Doubling the number of radials to improve performance can be accomplished later by placing a new one between each pair of existing radials. Directions covered by the array do not have to be at 90° intervals, unlike the 4-square. The only constraint is that the director and reflector must be in a line with the driven element (tower). My choices (already surveyed and staked) are: 50° and 230°; and 160° and 340°. The first pair covers Europe and most of the US and Pacific. The second pair covers Japan and east Asia, and the Caribbean and South America. From here those are the most productive directions for contests. The beam width is wide enough that there are few coverage gaps, and one can always resort to the omni-directional mode. As mentioned at the beginning the weather turned foul very quickly in December. I did manage to get the tower anchors installed mere hours in advance of the initial blast of frigid temperatures. During a brief January thaw I tested the anchors and found them to be inadequate. The screw (auger) anchors have to be longer and/or wider to withstand the wind load. Altering or replacing the anchors is not difficult but it cannot be done in the winter. Hence construction is delayed by a few months. Once the tower (driven element) is up and the radials rolled out I will compare it to the high inverted vee so that I have data on how they compare. After that the inverted vee will be removed, at least for the time being. The tower has to be cleared of obstructions to raise side mount yagis, a priority this year.